Explore the widening gap between consumers’ eCommerce expectations and retailers’ ability to meet and exceed them. This exclusive report reveals that retailers still have a long way to go if they are going to deliver on their promise of giving consumers what they say they want when shopping online. Nearly half of consumers feel it’s important for retailers to consider their browsing history and online purchases when customizing marketing for them. 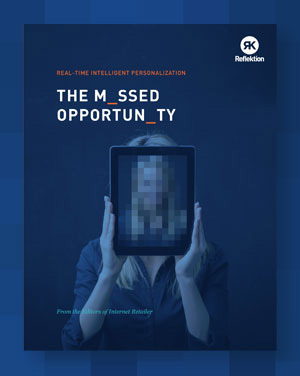 Fewer than half of the Internet Retailer Top 100 online retailers have mastered basic tenets of personalization, and an even smaller number use more advanced techniques. Retailers who understand the lackluster performance of top eCommerce players and take note of how others are solving the personalization equation will gain a critical competitive advantage and remain ahead of the pack.